A large group relaxes in the 2018 Big Apple Barbecue's VIP section in the middle of Madison Square Park. This past weekend, event organizers of the Big Apple Barbecue Block Party (BABBP) were told by Madison Square Park officials that the event would not take place at the park next year. 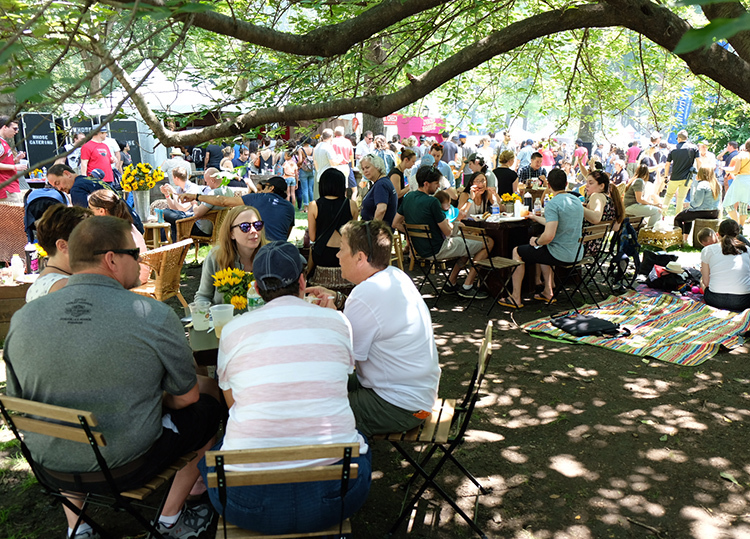 The BABBP has been hosted in and around Madison Square Park for the past 16 years, so this will be a substantial change for NYC’s largest annual BBQ event. The event’s pitmasters, many of whom travel from other states to attend, were told of the news prior to the event. Many of the pitmasters at the event, including Chris Lilly from Big Bob Gibson Bar-B-Q and Justin Fox from Fox Bros. Bar-B-Q, told me they would likely come back next year as long as the event did not change too much. It is unclear at this time where the event will be held next year. Potential options could include large piers in both Manhattan and Brooklyn, the Citi Field parking lot (which recently hosted The World’s Fare), and Randall’s Island Park (which regularly hosts Governor’s Ball, Panorama, and big concerts). Read my full roundup of the 2018 Big Apple Barbecue Block Party, including more about what it moving could mean for the event’s future.